Brooklands New Mini Day was on the 25th March 2012. It was a very last minute decision for us to go as I had been due an operation on the 19th March which would have prevented us going. However, this was cancelled and eventually rescheduled for the 26th March. This then needed to be a day of fun to stop me worrying about the surgery the next day. I wasn't disappointed. We drove down to Ashtead on the Saurday and stayed with my cousin Lorraine and we had a lovely dinner on Saturday evening with Lorraine, my Auntie Enid and Uncle Jim and my other cousin Andrew and his wife Christie. 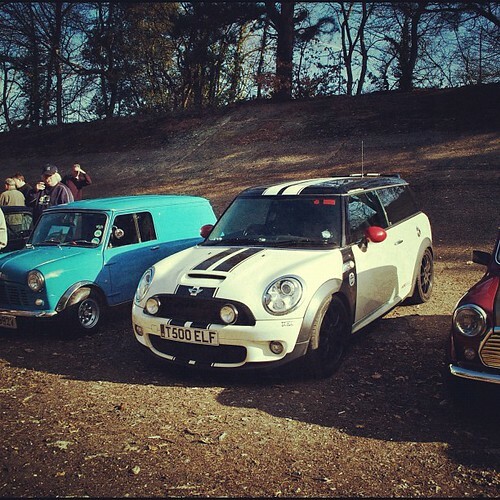 Next day Uncle Jim joined us at Brooklands for a wander around the Mini event. All in all this made for a very pleasant weekend. Sunday morning came and we got there at around 9.30 and parked on a part of the old Brooklands track, which instantly makes it all feel a bit special. Soon afterwards we met our friends Storm and RVW who had come to the event from Lincolnshire, in their Dubman. Ray's Dubman had recently had a disastrous encounter with an inept graphic fitter and it was good to now see the car's roof with its new painted graphics which give the car a very contemporary look very different to the retro look that you get with conventional vinyl graphics. I am sure a lot more new Minis will be opting for this look instead of vinyls as more people see Ray's Dubman on the circuit. 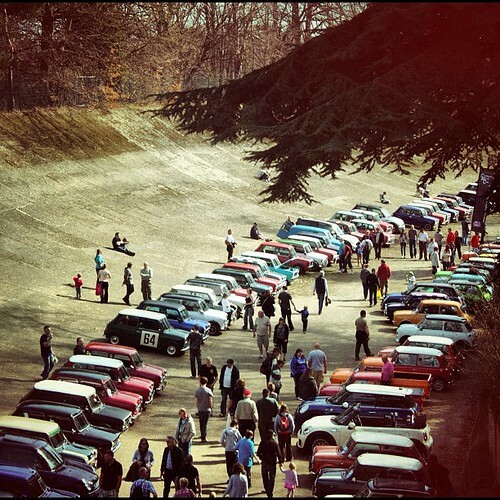 The event is very much geared towards the classic minis, so there was little to buy or see for the New MINI. However, they were there and we got to see a very well graphiced white Countryman, the new Roadster and the new Coupe Works. The Roadster is a handsome devil, but we have our Opel so it does not come into consideration for us. The Coupe Works though is a different matter. It is a bit gawky looking and that does send me warning bells but it seems such a perfect little coupe, dinky and fast and I keep thinking it is the perfect car for Mrs P. Just around the corner though, is the Countryman Works, which has perhaps the better balance of practicality and performance especially as we can get snowed in in our cars here halfway up the Malvern Hills. Anyway this is the dreaming that we do as we wander around events such as this and there is no harm in dreaming, so long as you are prepared to one day try and make your dreams come true! About half eleven Uncle Jim turned up. He is a Korea veteran and he always adds an interesting slant to matters, be they cars, engineering or the armed forces and his company certainly added to the day. Oddly the last car event I did in 2011 was Brooklands and here it is our first for 2012 but the museum is certainly up to 2 visits in a row as there is always something extra going on on top of the usual museum exhibits. I always get a little sad though when I see Concorde. It should still be gracing our skies. Anyway it was a great way to kick off our 2012 car events calendar and our next two events have now been confirmed, A New Mini Severns meet at the end of April and then MINI United in the South of France in May. PS Click on photos for a slideshow fof the day.